The President of the Court of Appeal in consultation with the Chief Registrar of the Judiciary is responsible to the Chief Justice for the administration of the Court of Appeal. The Court of Appeal President is a judge elected by the judges of the Court of Appeal from among themselves to serve for a non-renewable term of five years. 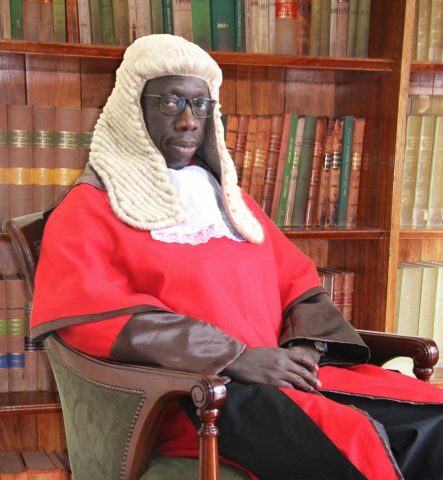 Justice William Ouko is the current President of the Court of Appeal of Kenya. He was elected by his colleagues on 9th March, 2018 to replace the Hon. Justice Paul Kihara Kariuki, whose term had come to an end and was subsequently appointed the Attorney General of Kenya. Born on 21st November 1962, Mr. Justice Ouko joined the judicial service in 1987 as District Magistrate II (Professional) rising to become a Deputy Registrar of the High Court in 1989. Later in 1997, he was promoted to serve as the first Chief Court Administrator of the Judiciary. Mr. Justice Ouko rose to become the Accounting Officer for the Judiciary after he was appointed to the position of Registrar of the High Court in 2002. During this period, Justice Ouko served as Secretary to the Judicial Service Commission and Secretary to the National Council for Law Reporting (NCLR). He was appointed as a Judge of the High Court in 2004, and as a Court of Appeal Judge, in 2012. Besides serving as a Judge, Hon. Ouko served as member of the Delinking Committee of the Judiciary, East African Judicial Education Committee, Government of Kenya Technical Committee on the Implementation of Legal Sector Reform Programme and the Reform and Development Committee of the Judiciary. He served as Joint Secretary to the Presidential Committee appointed to inquire into Terms and Conditions of Service of the Judiciary (Kotut Committee), Committee on the Administration of Justice (Kwach Committee) and the Judicial Commission of Inquiry into the Goldenberg affair. He chaired the Judiciary Service Staff Regulations Committee, the Task Force on the Judiciary Staff Superannuation Scheme, Task Force on the Judicial Reforms, Judiciary Transformation Programme Implementation Steering Committee, Court of Appeal Strategic Plan Committee, Court of Appeal Case Management Committee, Committee on Pauper Briefs and Pro Bono Services, the Judiciary Training and Development Policy Committee. Further, he was chair to the Inter-ministerial Committee on the Judges’ Retirement Benefits and the Court of Appeal Bar – Bench / Court Users Committee and vice chair of the Technical Committee to develop a criminal procedure Bench Book. Mr Justice Ouko holds a Master of Arts degree in Criminology and Criminal Justice (MACJ), Bachelor of Laws degree (LLB) from the University of Nairobi and a Diploma in Legal Practice from the Kenya School of Law. He attended Senior Management Course training at Kenya Institute of Administration (KIA), Administration of Courts in the USA and the Judicial Administration at the Royal Institute of Public Administration UK, Good Governance and Accountability in Washington International Management Institute (WIMI), USA.